Handmade by artisans in Nepal, this felt coin purse features a slice of watermelon. Measures 6 inches across. 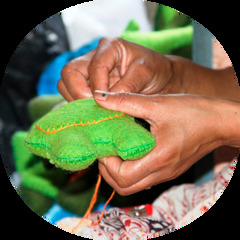 Fair-trade Artisan Marketplace : SUSTAINABILITY SOURCED PRODUCTS : *** We believe in the power of a green community to share information about conserving energy, reducing waste, re-using and re-cycling.